Congregations who participated in the second Communities of Hope training all shared similar hopes and fears as they sat together around tables discussing aspirations and hesitations. Communities of Hope, the strategic planning, asset-based community development program developed by the United Methodist Church of Greater New Jersey, equips leaders to identify assets in their community and build toward positive transformation through alliance building and action plan development. 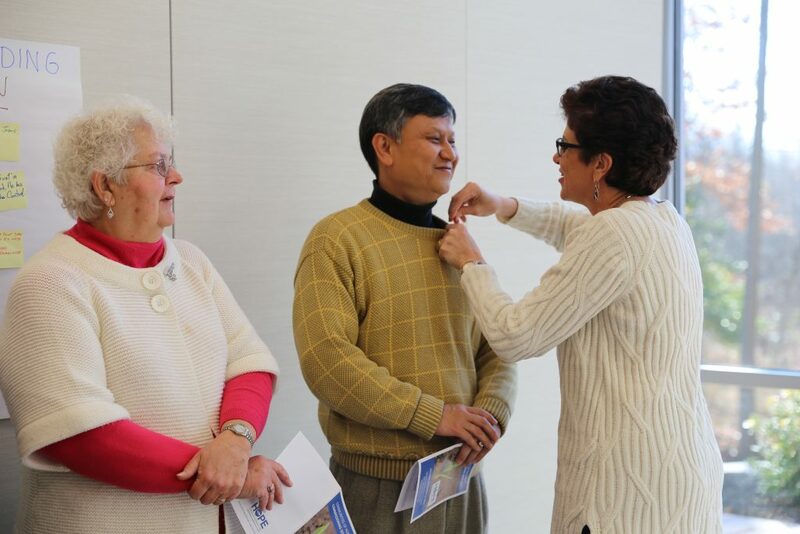 Its second commissioning ceremony was held on Dec. 10 at the Mission and Resource Center in Neptune. Congregation teams from Trinity UMC in Roebling, Fieldsboro UMC and a cooperative parish of several collaborative churches in the North Hudson area gathered to celebrate the completion of their six-month intensive training and pray over their community development initiatives. “The commissioning provides an opportunity to celebrate the work of these teams, mark the end of their training and the beginning of their implementation process moving forward,” said Nicole Caldwell-Gross, Director of Missions, who led the program and met with each team throughout their training period to assist in the development of their individual community asset-based plans. “We’re raising up ambassadors of hope to these communities,” she said. Bobbie Ridgely, Executive Director of A Future With Hope, addressed the trainees. A Future With Hope, which was launched in the aftermath of Superstorm Sandy to aid in long term recovery, is shepherding its resources to move into community development; becoming the mission arm of GNJ and the umbrella for Communities of Hope and Hope Centers. The room bustled with murmurs of anxious excitement as the trainees wrote down those hopes and fears on post-it notes and placed them on a board. Through their training, the groups learned specific ways in which they could benefit their communities by identifying needs, setting priorities and working in partnerships. The program teaches how collaboration with different faiths, residents, local organizations, schools, government and business broadens the scope of what can be accomplished and yields results with lasting impact greater than one group or congregation can establish alone. The idea is to generate new models of development, testing programs which can be replicated in other communities. A Future With Hope Case Manager Andrea Wren-Harden helped facilitate the commissioning and shared that prayer, networking and trusting in God are all important aspects of moving forward with community development projects. “Part of Communities of Hope training is to encourage congregations in changing mission fields that are income generated to pour back into the community,” said Caldwell-Gross. In June, Rutgers University Assistant Professor Dr. Jeffery Robinson of The Center for Urban Entrepreneurship and Economic Development led a day-long summit at the Mission and Resource Center as part of the Communities of Hope program. “Jesus was a risk-taker, and in His narrative preaching engaged all the major industries of His day including shepherding, fishing, winemaking and even investing,” said Caldwell-Gross, who praised the new social entrepreneurship aspect of the program. Bishop Schol addressed the commissioning ceremony via video message, congratulating the three sites for their out-of-the-box thinking and discernment as to what’s happening in each of their communities. He challenged the trainees to inspire others to work with them and imagine possibilities. Schol encouraged the congregations to tell their stories and take their action plans step by step; starting small and building out. “God wants to raise up hope, and you can make it happen,” he beamed. Through 2016, 20 communities and more than 200 people underwent Community of Hope training and have begun transforming their communities. In Highlands, a congregation and residents partnered with the Borough Council and the Department of Public Works to clean up and bring properties up to code for low-income, disabled and elderly residents. To date, they have refurbished eight properties and engaged close to 100 community members in their work. Additionally, three congregations in Atlantic City are working together to explore affordable housing options for residents with a vision of purchasing blighted property to transform into opportunities for home ownership. As Sandy recovery ministry winds down, GNJ is gearing up to train churches to engage in community ministry with a goal of launching 100 Communities of Hope or ‘Hope Centers’ over the next 15 years. Gateway North District Superintendent Rev. Manuel Sardinas addressed the financial fears of the congregation’s action plans at the commissioning ceremony. “Money is an issue, but we need to walk by faith,” he said. Sardinas has already started working with a group of churches in Jersey City gearing up for the next training. Although located in different neighborhoods, the churches are connected by one of the main arteries of the city, JFK Boulevard. Their community outreach and engagement includes food banks, feeding programs, after school care, homeless outreach and help for undocumented persons. Five pastors serve these churches, and they are connected to and engaged with the other faith communities and clergy associations of the city. Schol concluded his message by reminding the trainees that God was in their midst. “People see God in your hope and actions,” he said.